The School of Arts opened in 1891 and consisted of two buildings, The School of Arts on Stanley Street and Her Majesty’s Theatre on Walker St. Her Majesty’s Theatre was the first theatre in Northern Queensland to be made of brick and had seating for 600 patrons. The School of Arts contained meeting rooms and classrooms on the ground floor, with the top floor containing a large library. Classes were held for singing, drawing woodwork and even gas cooking. Prior to the opening of the Theatre Royal in 1900, Her Majesty’s Theatre was the leading performance venue in Townsville and continued to remain popular throughout the early 1900’s. A variety company formed by local Aborigines performed here in 1907 and Dame Nellie Melba performed here in 1909. The buildings were hit by cyclone Sigma in 1896 and again in 1903 by cyclone Leonta. There was significant damage to both buildings. Most of the western wall of Her Majesty’s Theatre had collapsed and the roof was torn of the offices. Fortunately the building was repaired in 1904. By 1913 it was decided Her Majesty’s was too small and an extension was added onto the auditorium at the Walker St end. In 1938 the building was used as the first free public lending library in Australia. During WW II, the Australian Defence Force requisitioned the buildings and they became the home to the RAAF Post Office for the Pacific Region. After the war Townsville Regional Electricity Board moved in and remained there until 1963 then the Northern Electricity Authority took over the premises until 1968. The late 60’s and early 70’s saw the building mostly vacant until in 1976 the buildings underwent extensive renovations. It then became known as an Arts Centre and the home for Pacific Festival offices, the Townsville Little Theatre and 4TTT. Throughout the 70’s & 80’s The School of Arts was a vibrant hub for music, dance, radio and festival groups. In 1985 the School of Arts became the permanent home for Dance North, Queensland’s only regional professional dance company. The Ann Roberts Auditorium is a black-box style space that features a full sized performance area in an intimate auditorium. 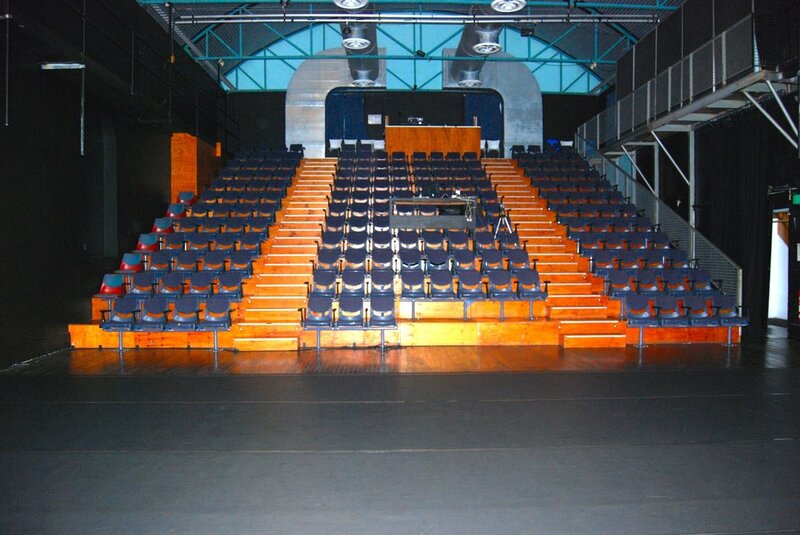 The performance area sits on the deck that was originally the stalls of Her Majesty’s Theatre. At the rear of the space behind the tabs is a Proscenium Arch Stage. This is primarily used for warm up, set construction, additional dressing rooms and on occasion as a stage for live musicians. The auditorium is fully air-conditioned. Gantries run the full length of the auditorium on both PS and OP, with 50mm pipe hand and kick rails that can be used to rig lamps from. Located on the second floor of the School of Arts Building, the room has a large Queenslander style balcony directly off it, accessed by 5 sets of French doors. The room is light and airy and the large balcony is a great place for entertaining and socialising. It is fully air-conditioned, has dimmable lighting and can be used as a performance space, a rehearsal studio or for functions and event. We can provide a boardroom table and chairs, projection, sound & lighting and café style seating for the balcony. The bar is operated by SOA for any occasion at no extra charge to the hirer. Prior arrangement is essential if bar facilities are required. Any event that is open to the general public will require front of house staff, the cost of which is built into the hire fee. The bar serves a range of beers, wines, spirits as well as soft drink and orange juice. Four high bar tables with 4 bar stools each are situated in the bar area. Six tables with 3 chairs each are set up for patrons on the veranda prior to performances. Also available in the bar area is our magnificent Yamaha Concert Grand Piano. For more information or to get a quote for your event, please fill out the enquiry form below or call 07 4772 2549. Thank you for your enquiry. A member of the Dancenorth team will be in touch shortly.